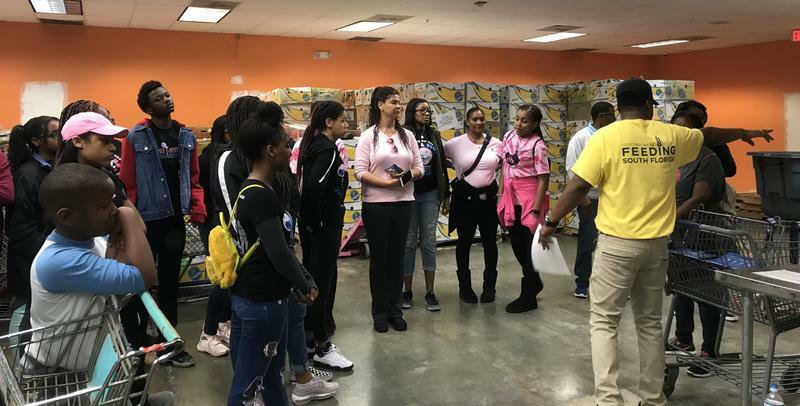 Inside of a large food bank warehouse in Pembroke Park, a group of students and their mothers spent Monday morning sorting food into banana boxes: Cereals, gummies, peanut butter, cans of corn, green beans and more. Each non-perishable food item gets looked over, and placed in what will become part of a care package for furloughed federal government workers. Some fresh milk, produce and meat will get added later, enough to feed struggling families for a week. Allen, 18, is the teen president for the mom and student service group, Jack and Jill of America – the Greater Fort Lauderdale Chapter. She is one of roughly 400 volunteers that sorted food at Feeding South Florida on Monday as part of the MLK Day of Service, an annual event in honor of Dr. King’s civil rights activism. “I do think this is the best way that we could give back,” Allen said. The food bank’s Executive Vice President, Sari Vatske, said every year on the holiday the food bank has extra volunteer shifts. But this year, the food will have to reach more people in need than usual because of the government shutdown. Feeding South Florida already feeds over 706,000 South Floridians every year from Palm Beach County through Monroe County. More than 240,000 of those people are children. Most of the beneficiaries may not know where their next meal will come from – or only be able to afford a certain amount of meals each month before they run out of money for food. Out of the 800,000 federal workers who are working without pay on Day 31 of the partial federal government shutdown, about 20,000 live in South Florida, according to the food bank estimates. The agency normally holds around 60 food distribution events each week – with the help of community partners – but now has added five extra food distributions every week for federal employees working without pay. To keep that pace, the food bank needs volunteers to help with the sorting of food way past MLK Day -they usually do it every day from Tuesdays through Saturdays-, and more volunteers to help at the food distribution sites for Prison, Airport, and Coast Guard workers. “There’s going to be a huge ripple effect if this government shutdown continues, which means a lot of that responsibility then falls on us,” said Feeding South Florida President and CEO Paco Vélez. For people who rely on federally-funded food assistance programs to buy groceries – like the Supplemental Nutrition Assistance Program, or SNAP, the payments for the month of February were issued on Jan. 20. These are the last payments people will receive for SNAP until the government reopens. Other federal food assistance programs at risk if the government doesn’t reopen before this time next month, include free and reduced breakfast and lunch programs at public schools. Vélez said the longer the shutdown continues, the more it affects the food bank’s long term planning – and who relies on Feeding South Florida for their next meal. “This man-made crisis is affecting the entire country, which means that we cannot draw down from other food banks or national donors that Feeding America works with,” Vélez said.